The only reason Hubscore matters is that it’s Hubpages’ requirement for DoFollow links. If your overall Hubberscore drops below 85, or an individual Hub’s score drops below 40, then links in your article are set to NoFollow. That means Google won’t count them when assessing the value of the sites they point to. Many people actively plant DoFollow links as a way to make their own websites rank better on Google— or so they hope. Personally, I’ve stopped caring whether links on my hubs are DoFollow. My websites, blogs and good articles attract plenty of dofollow links on their own from other people linking to them. That spares me from worrying about Google cracking down on various kinds of spammy backlinks. What Google wants to see (and use as a ranking factor) is links from other people who genuinely find your content valuable. To that end, Google’s Penguin algorithm is designed to filter out self-promotional links which tell it nothing about how good the content actually is. ‘Lo, folks. Back from adventures. The good: I managed to make a solo trip to the UK, including Scotland, Ireland, and northern England, which I haven’t visited before. I had a ball at a classic Who convention, indulged in geology and mythology geeking at the Giant’s Causeway, poked around old castles and ruins, and rambled around in the British Museum saying hello to all the bits of Greece that aren’t in Greece. (Sooner or later I need to post about the Elgin Marbles controversy.) Also, Flynn the Cat and I hung out. Thank you, Flynn, for putting up with my being so ragged! The bad: Bleeding ulcer. I was too stubborn to cancel my trip, but boy howdy do I never want to travel again while feeling that awful. I’m now on the mend, and finally able to sit at the computer for enough time to work. Also good: My Buzzfeed-style listicle, 25 Funny Things on Google Maps, picked up Hub of the Day on Jan 4. Mind you, I’ve always mixed feelings about that article. In 2012-2013, it was my top-ranked Squidoo page, thanks to high traffic and clickouts. I’d like to think that my educational articles are better quality. On the other hand, I did go the extra mile (so to speak) to hunt down interesting information about each item on the list. So thanks, HP. I hope someday one of my meatier articles earns an HotD nod. I gather that transferred Squidoo articles were given a two week extension before they undergo the full Hubpages Quality Assessment Process? At least, when I was working on revisions last week, the warning messages on those flagged with “overly promotional links” said that I had two weeks to bring them up to snuff. I just checked Google Analytics to see how my Squidoo lenses are faring after transfer. 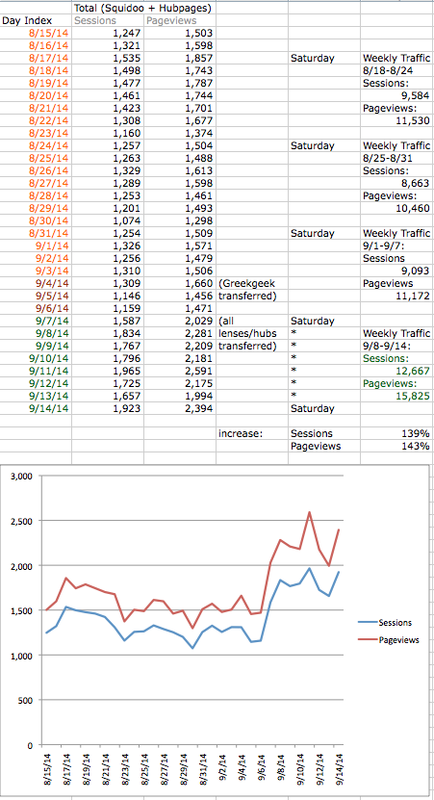 Here’s their daily traffic stats according to Google Analytics. (Scroll down for a visual chart of the boring data). Black alert triangle with ! : One or more links on this hub appears to have broken. Edit hub; the workshop will highlight broken links in pink. Hub title is red and there’s no icon in the “Featured” Column: either you haven’t published it yet, or you’ve chosen to unpublish it because it’s out of date and desperately needs an overhaul ;), or (I think?) if a hub is unpublished because Hubpages’ editing team / moderators have flagged it, it looks like this. Edit and fix problems, them publish again! Red © symbol: Hubpages has a detected a duplicate of this hub’s content elsewhere on the web. Edit the hub and look at the top. It’ll give you a link to the copied content. It also provides a link to file a DMCA notice if Hubpages has figured out where to report that particular site. Black circle with white H: A featured hub. It’s live, it’s indexed, it’s visible. Half circle: Unfeatured hub. It’s still live, it’s visible to your Hubpages followers (I think? ), and it’s visible if you send someone to it with the link, but it’s no longer crawlable by search engines. Review the suggestions at the upper right in the Hub workshop, edit and publish, and it’ll be featured again after going through another Quality Assessment (takes a day or two). See my guide on keeping Hubs featured for more tips. White circle: Failed Hubpages’ Quality Assessment Process. See Hubpages’ guide to Featured hubs and the QAP. A gray circle of two arrows chasing each other: Hub is newly published, and it’s pending the Quality Assessment Process before it’s added to Hubpages’ index. The hub is visible if you send someone a link, just noindexed. Nowadays the QAP usually takes less than 24 hours. You’ll know it’s passed when the gray circle turns into the black circle with the white “H” indicating it’s Featured. I have a few “unfeatured due to lack of engagement” hubs. I may massage them to try and drive more traffic to them. Or I may just ignore them. Once you’ve published many hundreds of articles, having a few that have fallen out of circulation is no biggie. 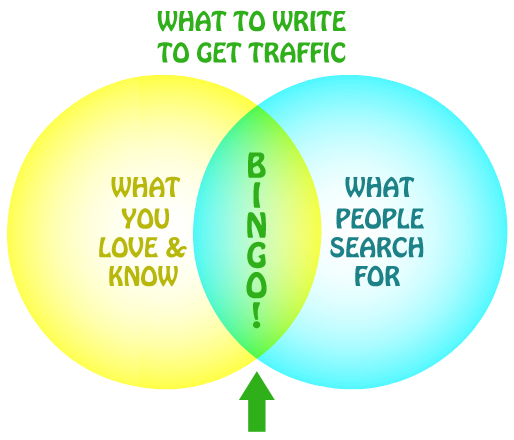 In fact, it may be useful to learn from: why didn’t it draw traffic or engage readers? Also notice the “last edit” date. Hubpages doesn’t care when you last updated. All it cares about is that the article is still drawing readers who are interacting with (or at least reading) it. Squidoo does not claim ownership of the Content you place on your Lens. The Content will be owned by you or a third party from whom you got permission to post the content. I suppose, since Squidoo is merging with Hubpages, a lawyer could argue that Hubpages is now, legally, Squidoo, in the same way that my old bank is now owned by and named something else. Nevertheless, it feels a bit shoddy, especially with the “good news” spin in Seth’s announcement and the incredibly short notice. That discourtesy towards members also doesn’t surprise me. In a way, I’m relieved — the death by a thousand paper cuts is over, at long last. Nevertheless, I feel enormous sympathy for the many members who were still active and passionate about keeping the site going. You folks were just kicked in the gut. I wish I could wave pom-poms and give you “good news” and put a positive spin on this. But… I’m worried about those of you whose family budget depended on that Squidoo pay day. Nevertheless, it’s not all bad news. Well! I turn 7 on Squidoo today. Much has happened since my last Squidbits post. I got banned! (Only from Squidoo’s HQ blog and forums, at a time when I hadn’t been posting on them for many months.) As far as I could tell, HQ thought my last Squidbits post “too negative,” according to the form letter I received. Thus chastened, I stopped posting. Ironically, my Squidoo lenses are now attracting approximately the same amount of traffic that they were drawing back in the halcyon days of 2012, although they only earn about 1/4th of what they did back then. …when the heck did Google change “unique visits” to “sessions”? Don’t be fooled. My March traffic upsurge is largely due to a niche account capitalizing on new, remastered releases and sequels to some popular titles. (I say vaguely, since my niche account is connected to a fandom alias that I prefer to keep as an alias). Yes, I did plan ahead with lens updates and articles that anticipated said releases as far back as 2011; I have not totally abandoned my old skills. I expect that niche traffic to tail off again over time. So, what have I been doing with myself on Squidoo? This is my attempt to round up a year’s worth of changes on Squidoo, with particular focus on which Squidoo changes and which Google algorithm updates may have caused traffic gains or losses. As usual, I’m using Hubpages as a reference, because it’s a comparable site, although its traffic trajectory has been quite different. (Hubpages took its big Panda hit in Jan 2011, and has been climbing back ever since; Squidoo was mostly unaffected by Panda until Nov 2012). I’ve marked specific dates of Google algorithm changes plus significant events at Squidoo. Jul 5, 2012: START. Squidoo and Hubpages both draw ~1 million global unique visitors a day; Squidoo is on top. Jul 24, 2012: Panda #17. Sistrix shows both Squidoo’s and Hubpages’ overall visibility in Google search results DOWN 10%. [See Google’s guidelines on what Panda rewards]. Aug 10, 2012: Pirate / DMCA update. Both sites unaffected. Aug 15, 2012: Departure of Megan Casey, Squidoo co-founder and Editor-in-Chief. Aug 20, 2012: Panda #18. Sistrix shows Squidoo UP 3%, Hubpages UP 9%. Sep 18, 2012: Panda #19. Sistrix shows Squidoo UP 1%, Hubpages DOWN 2%. Oct 5, 2012: Third Penguin Update. Sistrix shows Squidoo UP 13%, Hubpages DOWN 32%. [Searchengineland explains Penguin, Google’s explanation]. Oct 31, 2012: Squidoo implements Postcards. Nov 5, 2012: Panda #21. Sistrix shows Squidoo 35% UP, Hubpages unchanged. Nov 12-16: Sporadic Squidoo traffic drops. Several veteran Squids report significant traffic drops at a time when traffic is usually increasing due to holiday shopping season. I have never been able to correlate this to a known Google algorithm update, unless it was a Nov. 15 change in Google Image Search. Nov 26, 2012: Squidoo implements Crowdignite Ads. These have finally been replaced with “related” Google ads; not sure when that happened, but it’s after Mar 1. Dec 7, 2012: Squidoo implements “Responsive Layout“ redesign. Quizzes, polls, and some Amazon and eBay modules break or lose content, and new ads appear in the middle of lens body content for mobile devices and on some web browers (Chrome OSX). Dec 21, 2012: Panda #23. Sistrix shows Squidoo 14% UP, Hubpages 9% DOWN. Jan 22, 2013: Panda #24. Sistrix shows Squidoo 15% UP, Hubpages 3% DOWN. Mar 5, 2013: Squidoo adds “You may also like” with 5 supposedly-related products to the bottom of every Amazon module. All Amazon module content blocked by Adblock on Mar 6, and on Mar 7, Squidoo discontinues “You may also like,” but Adblock continues to block Amazon modules for several weeks. Mar 12, 2013: Squidoo implements new “Discovery Bar”, at first covering part of first screen of content, then moved down, then removed on Mar 18. On May 28, HQ replaced it with a popup for non-logged-in visitors. Mar 19, 2013: Giant Squid conference call with Seth, Bonnie & Gil. Mar 21, 2013: Squidoo bans most coloring pages. 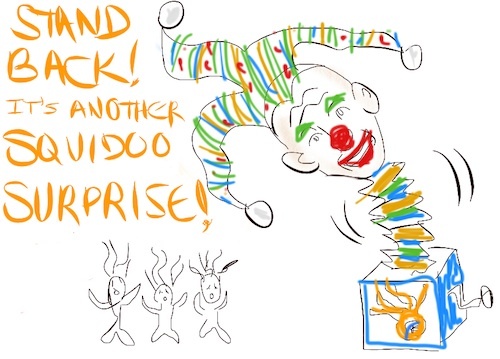 Mar 25, 2013: Squidoo’s new filters announced, giving members 7 days (Giants 21? days) to fix flagged lenses before they’re locked. Some members choose to delete/move flagged lenses. Thousands of lenses must have been locked after this window. Since then, many members have reported finding lenses locked without warning. Mar 28, 2013: Squidoo Nofollows all outbound links. May 7, 2013: widespread reports of “Phantom” Update, unconfirmed by Google. May 13, 3013: In response to many people bewildered by “thin content” flags and locks, Bonnie posts about Keyword Density. May 16, 2013: New Squidoo Homepage. At first it’s missing links to categories, making them unfindable to search bots, but now those links are restored. May 22, 2013: Penguin 2.0. Sistrix shows Squidoo 25% UP, Hubpages 8% UP. May 29, 2013: Subdomain testing. June 10, 2013: Outbound link limit more strictly defined. June 18, 2013: second Seth Godin/ HQ conference call. April-June: Squidoo changes or retires “About Me” and “My Lenses”, Poll module, Amazon modules, Photo Gallery, Twitter, Video modules. After each of these changes, many lensmasters report lost/deleted content from these modules, which searchbots may notice. There’s seasonal cycles. Squidoo usually had a shopping-related traffic swell starting in September, cresting at Halloween, peaking again just after Thanksgiving, and staying more or less elevated until Christmas, with a lesser peak at Valentine’s Day and then a slight summer slump. (Part of the reason that veterans started sounding the alarm in November was that traffic was dropping at a time when it normally increased). “Correlation does not equal causation.” Sistrix measures when a site has gained or lost a lot of search visibility by checking to see where it ranks on a huge database of search terms that Sistrix keeps re-checking. It assumes bit traffic shifts are related to the most recent known Google update, but there might be other causes. If Squidoo is tinkering under its own hood or purging a lot of content, that may result in traffic changes on that site which have nothing to do with Google updates. After significant changes, there may be a lag before Google and other search engines recrawl pages they’ve visited before and make adjustments. During holiday shopping season, the full extent of traffic losses on Squidoo may be masked, because Squidoo has so many sales-related pages. Also see: Yuku forum thread where various lensmasters are sharing their May 2012-May 2013 and June 2012-June 2013 traffic stats and changes. Around November 17, 2012, Squidoo and many sites across the web experienced major traffic changes. In Squidoo’s case, it was the worst drop I’ve seen in years. Barry Schwartz of Seoroundtable got a brief nonanswer from Google about it. One thing is clear: it’s not a Panda update. Google said Panda would be updated in the next week. I don’t think it’s an EMD update, because that specifically targets domain names — the website part of a URL, not the individual page’s filename. (squidoo.com = domain name, /my-cool-lens = the filename.) I also don’t think it’s Penguin, because the main target of Penguin is sites using artificial link schemes and other heavy-duty black hat SEO practices which I think are beyond the capacity and budget of even the most spammy Squidoo lensmasters. P.S. Credit Where Due: Thanks to Victoriuh for pointing out some of the SEO industry analysis posts that I cite below.